Terrific panorama, Mary Jo. F&V. 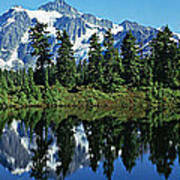 Mount Shuksan is a glaciated mountain in the North Cascades National Park. Shuksan rises in Whatcom County, Washington immediately to the east of Mount Baker, and 11 miles south of the Canadian border. 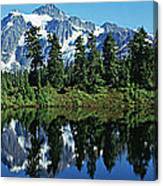 On a clear day it casts a perfect reflection in Picture Lake.